Good morning awesome readers! The time has come to get rid of the gully that runs along the garden. This is the same gully that turns to a river every time it rains. We are going to transform these into two terraces, and more importantly more growing space. The terraces will step down to a small pond at the bottom. The work has already begun, if you remember from our sorting a swale series. here, and here. The first dirt has been laid down. We have also seeded what is there with buckwheat to begin building the soil into better shape. Now it is time for the first retaining wall to be sure the soil stays put. To do this there is some measuring to be done. I need the distance across the terrace, and the height of the wall I’m looking for. I first measured across the width and got ten feet. Next I employed a 2×4 to run out to where I want the terrace to end. 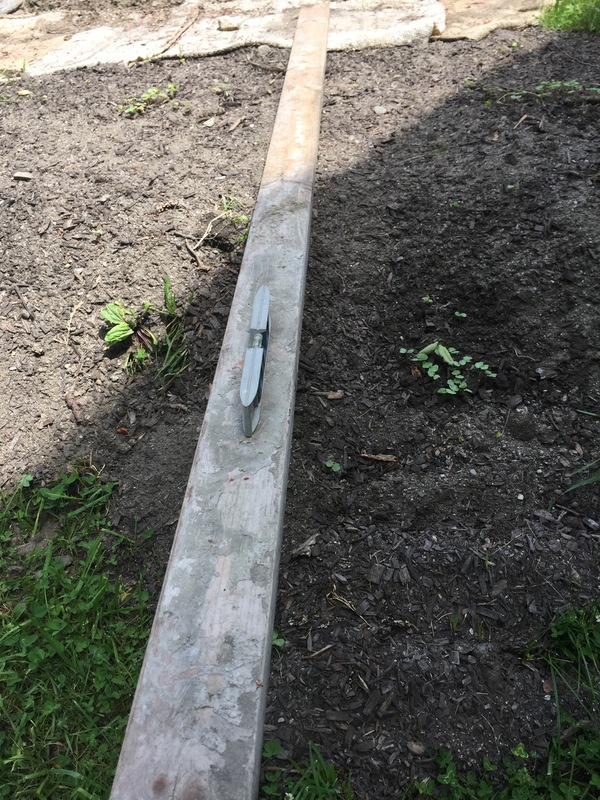 After leveling the beam I took a measurement of two feet. The amount of beam lumber I have though is not enough to finish the terrace in one shot. I guess I will need to put a bit of money out on this piece.